The book is better than the movie. It’s a common complaint from people who read a lot. It’s often true but you know what? Movies aren’t books. They’re movies. It seems obvious but I think many people just don’t really grasp how different writing a screenplay is from a novel. In fact I think most people, even avid moviegoers, have very little idea what goes into writing a screenplay. It’s hard. And when it’s an adaptation the writer gets a nice albatross around his neck in the form of the source material. The better known the source material the bigger and smellier that albatross gets. It takes some nerve to adapt other writers’ work but if you’re writing a movie you have to fit it into the screenplay format. I picked these movies not because they’re good (though I liked all of them), but because the source material for each was well known. In many circles it’s even considered sacred. It’s hard to fathom it now, but there was a time when it was pretty hard to get a comic book title onto the big screen. The X-Men presented even more challenges than normal. Not only was it a team-based title but over its decades long run it amassed dozens upon dozens of characters with their own origins and storylines. Even the most rabid fanboy would have a tough time naming them all. So how do you take a work with a gazillion characters in years long storylines and write a movie from it? Well, you lose the gazillion characters and years long storylines. The writers focus on a few key characters, mostly Wolverine and Rogue. 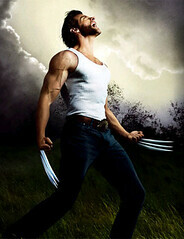 Wolverine is, of course, wildly popular and a great tough guy. Just what the hell he really is and how he got that way is perrenial story material in the comics. It’s still in the movie but it’s not central. Wolvrine learning that he doesn’t have to be alone and that he can care for others is. The other mutants are there but they’re carefully kept in the supporting cast of the movie. Even heavy hitters like Professor X and Magneto. Wolverine performs most of the action and he does it to protect Rogue. The first thing this does is give us some characters we can identify with for the whole movie. The second is we don’t get overwhelmed with a tsunami of mutants we can’t keep straight, let alone grow to care for. There are plenty of mutants involved in the conflict and more in the background at Xavier’s school. Good stuff for the fanboys but someone who has never read one of the comics can keep the main players straight. There are a few smirking references to nicknames and yellow spandex in the script. These acknowledge the comic book world but also acknowledge that the movie world is different. The world they wrote is much closer to our own and less disbelief has to be suspended. The intricate supertechnology that looks so good in comics is toned down to more melievable devices. Something you might see on FutureWeapons. Instead of an alternate comic book universe we feel like this is a glimpse of our near future. The end result? The movie feels like a movie not a comic book. Since the viewer can focus on a manageable cast of characters they get out of the ‘soap opera’ feel of monthly stories and into the more immediate feel of a three act movie. Tight, swift moving action with easily identifiable characters who travel through believable arcs. That’s good adapting, people. Next movie: The Lord of the Rings.